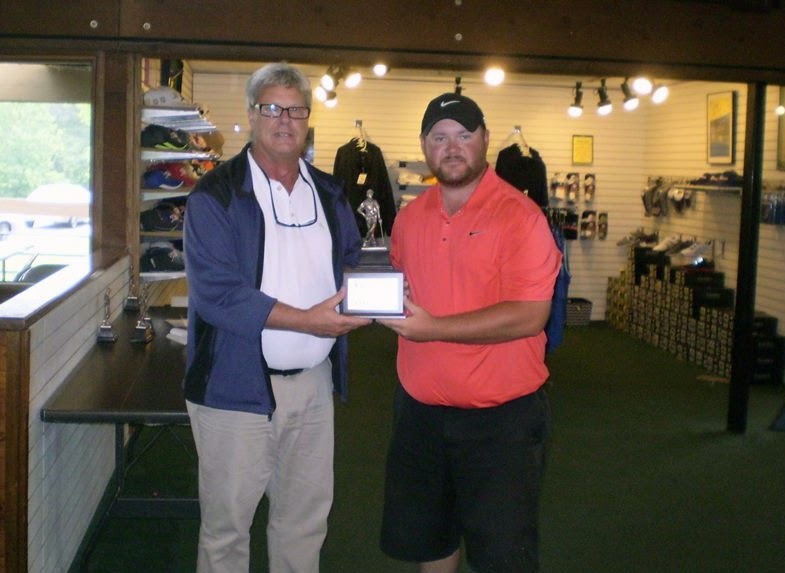 KANSAS CITY, KAN. ----- J.R. Munson's third Wyandotte County Open championship proved a little easier than the first two. "It was the first time I could sleep with the lead," said Munson, who opened up a five-shot lead with a 2-under par 70 after the opening 18 holes en route to a four-shot win in the 38th WyCo Open at Sunflower Hills Sunday. Comfortably in the lead, the 28-year-old Munson played it close to the vest the rest of the way, finishing with a 2-over par 74 for an even par144 total that was four shots in front of the 2013 champion, Kyle Ritchie. Reece Nigh and Eric Pahls deadlocked for third at 151 with Jerry Reid fifth at 152. Munson took command on the final nine Saturday with a string of four birdies in five holes. Precision iron play left him birdie putts of six feet or less on Nos. 10, 11 and 12 and he added a 12-footer on No. 14 on the way to the 2-under 70. "I played very well Saturday," he said. "It could have been a lot lower but the greens were slow and I couldn't get a good read on them." With the five-shot lead, Munson took no chances of giving it away on Sunday. "I told myself to play it smart. Keep it simple and don't do anything stupid. Just play for par." After a slow Sunday start with bogeys at Nos. 3 and 4, Munson righted himself with a string of four birdies in six holes - No. 6, 7, 9 and 11 - and cruised in despite an ailing back. "My back went out on me on No. 12," he said. "I've been fighting a pinched nerve and bulging disk since February." In the end, it was Munson's crisp iron play that was the difference. "I hit 14 greens in regulation both days and was able to put the ball in play with good angles," said Munson, who credited playing Nike's new RZN black golf ball being a factor. "It was a big difference because the greens were so soft." A freshman at Kansas City Kansas Community College when he won his first WyCo title in 2005, he won his second in 2009 after giving professional golf a shot in 2006. A KCK native, he works in security at Farmers Insurance in Johnson County. Other flight winners were Brian Perdieu, who also had Kansas City's longest putt, A; Easton Nigh, B; Bob McNellis, C; Dave Klein, D; and Len Zimmerman, E.
CHAMPIONSHIP - 1. J.R. Munson, 144; 2. Kyle Ritchie, 148; 3. (tie) Reece Nigh, Eric Pahls, 151; 5. Jerry Reid, 152'; 6. Brad Ansley, 154; 7. (tie) Tim Skorija, Parker Miller, Stan Wiehe, 156. A - 1, Brian Perdieu*, 152; 2. Bob Chatterton, 102; 3. Kevin Rome, 109; 4. Tim Nick, 162; 5. (tie) Jake Laing, Keith Capps, 164. B - 1. Easton Nigh, 155; 2. Mike McNellis*, 157; 3. Todd Milberger, 157; 4. Rick Richardson, 158; 5. (tie) Troy Templeton, Stuart Hunt, 160; 7. Daron Maier, 162. C - 1. Bob McNellis, 161; 2. Bill Campbell, 162; Dan Maskil, 164; 4. Jeff Hanchar, 167; 5. (tie) Norton Jizbalm, Bill Hashman, 168; 7. Ian Tomasic, 172. D - 1. Dave Klein, 168; 2. Ron Medley*, 173; 3. (tie) Mike Super, Jay Sutera; 5. Doug Winkelbauer, 175; 6. Kyle Norris, 176; 7. (tie) Tim Hinkle, Chad Cowher, 177. E - 1. Len Zimmerman, 170; 2. Chris Bean, 180; 3. Bill Pratt, 4. Rob Robson, 186; 5. Greg Schmidt, 191; 6. (tie) Phil Hoffman, Roger Miller, 195. * - Won scorecard playoff. Kansas City's longest putt - Brian Perdieu. SATURDAY - Closest to hole: Pat Seber-Bradley, No. 4; Roger Miller, No. 8; Stuart Hunt, No. 13; Kevin Rome, No. 16. Longest putt: Chuck Vallejo, No. 9. Long drive, Troy Templeton, No. 10. SUNDAY - Closest to hole: Jon Swinney, No. 4; Tristan Abs, No. 8; Danny Maskil, No. 13; Tony Reed, No. 16. Longest putt: Rick Kempf, No. 9; Long drive: Troy Templeton, No. 10.